Sanya is one of nine new sites in 2008 on the SWATCH-FIVB World Tour calendar along with Adelaide (Australia), Guaruja (Brazil), Prague (Czech Republic), Osaka (Japan), Myslowice (Poland), Moscow (Russia), Barcelona (Spain) and Dubai (United Arab Emirates). With Sanya hosting its first event, China joins France, Norway and Poland in hosting multiple SWATCH-FIVB World Tour events. The double gender Sanya stop will also be the 2008 SWATCH-FIVB World Tour season finale. Sanya is the southernmost city in Hainan province, IN China with a population over 500,000. Revered for its tropical climate, Sanya has become a get away from Hong Kong and a relaxing place for extending a holiday with a long trip back home. The first international Resort hotel was opened and managed by Swiss hotelier N.C.Solari in 1999, in the beautiful location of Yalong Bay. Nowadays, several international hotel chains have established in what is becoming a world-known destination, especially since the famous beauty pageant Miss World took place there. It all started with another resort this time in Sanya Bay, the Palm Beach Resort & Spa who welcomed the first Miss China beauty pageant in modern times. The relation created, brought the organizer Miss Julia Morley to decide for Sanya to welcome the international pageant the following year. Sanya will be the first city to receive the Olympic torch in the 2008 Olympics held in Beijing. The city has hosted the Miss World contest in 2003, 2004 2005 and 2007, the Mister World 2007 contest and the World's Strongest Man contest in 2006. China Men�s SWATCH Stops - With the Beijing 2008 Olympic Games looming, China hosts a men�s SWATCH-FIVB World Tour stop for the fifth-straight season. Shanghai hosted the country�s first double-gender international Beach Volleyball event in 2005 where Germany�s Christoph Dieckmann and Andreas Scheuerpflug upset Olympic champions Emanuel Rego and Ricardo Santos in the finals. 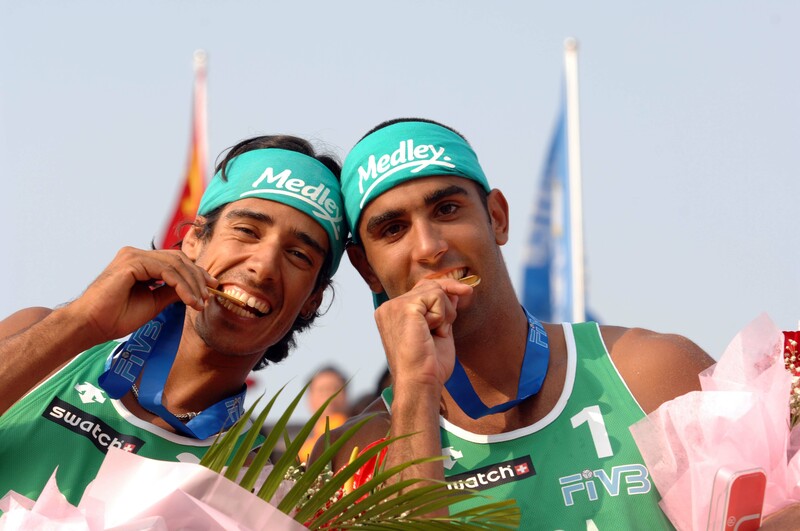 The men�s first SWATCH-FIVB World Tour event in China in 2004 saw Javier Bosma and Pablo Herrera of Spain upset Emanuel and Ricardo in the finals at Lianyungang. Three months later, the Brazilians defeated Bosma and Herrera for the Olympic gold medal in Athens. Marcio Araujo and Fabio Magalhaes have competed in the men�s Shanghai gold medal the past two seasons in All-Brazilian finals. Marcio Araujo and Fabio defeated Pedro Cunha and Franco Neto for the 2006 title before losing to Harley Marques and Pedro Salgado in the 2007 finale. The best finish by a Chinese team was a fifth by Penggen Wu and Linyin Xu in 2007 after being eliminated in the quarterfinals by Russians Dmitri Barsouk and Igor Kolodinsky. Pictured left are 2007 Shanghai gold medal winners Harley (left) and Salgado of Brazil. China Women�s SWATCH Stops - The women�s SWATCH-FIVB World Tour returns to Shanghai for the fifth-straight season as the international tour stages an event in China for the 11th-straight season. Dalian hosted women�s stops three times where Brazil�s Adriana Behar/Shelda Bede (1998 and 1999) and Liz Masakayan/Elaine Youngs of the United States (2000) won gold medals. Two Maoming stops saw Adriana/Shelda (2001) and Misty May/Kerri Walsh of the United States (2002) win titles. The 2003 Lianyungang event was won by the Rebekka Kadijk and Marrit Leenstra for the Netherland�s only FIVB women�s title. The Chinese teams of Jia Tian/Jie Wang have competed in the past two finals by losing to Chen Xue/Zhang Xi in 2006 and defeating Nila Ann Hakedale/Ingrid Torlen in 2007. At 17 years old in 2006, Xue became the youngest player to win an international Beach Volleyball title. The Norwegian silver medal in 2007 was the best-ever finish by a women�s team from the European country on the SWATCH-FIVB World Tour. Pictured right are 2007 Shanghai gold medal winners Tian (left) and Wang of China. Asian men�s SWATCH Stops - The 2008 SWATCH-FIVB World Tour men�s calendar features six stops within the Asian Continental Federation with three events in China, and one stop each Australia, Bahrain and the United Arab Emirates. It is the most events in Asia since three stops where held in 1995 at Korea, Japan and Bali. Brazilian men�s team have captured 11 of the gold medals with the United States 6, and one each for Spain, Germany and the Netherlands. 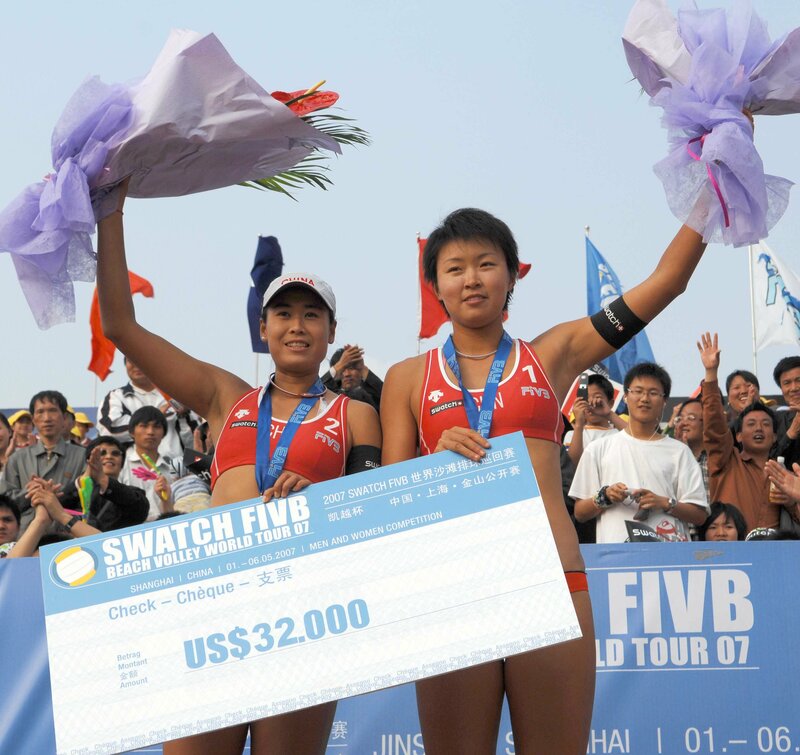 Asian Women�s SWATCH Stops - The 2008 SWATCH-FIVB World Tour women�s calendar features seven stops within the Asian Continental Federation with three events in China, and one stop each Australia, Korea, Japan and Thailand. It is the most events in Asia since five stops where held in 2001 at Macau, Japan, China, Hong Kong and Australia. The ABC�s of women�s Beach Volleyball (America, Australia, Brazil and China) have won 38 of the previous 39 events. The only title won by a European team in Asia was at a 2003 in China where Rebekka Kadijk and Marrit Leenstra of the Netherlands captured the gold medal.